Exception handling has truly been a blessing to us software developers. Without it, dealing with special conditions and writing robust programs was a lot more painful. But, like any powerful tool, badly used it could cause more harm than good. This article name the top three on my Exception handling bad practices list, all of which I’ve been practicing in the past but now stay away from. Have you ever come across code like this? Of all the bad exception handling practices, this is the worst since its effect is the complete opposite of the programmer’s intention. The reasoning goes something like this: Catching exceptions where they don’t hurt makes my program more robust since it’ll continue working even when conditions aren’t perfect. The reasoning could have been valid if it wasn’t for Fatal exceptions; Here described by Eric Lippert. Fatal exceptions are not your fault, you cannot prevent them, and you cannot sensibly clean up from them. They almost always happen because the process is deeply diseased and is about to be put out of its misery. Out of memory, thread aborted, and so on. There is absolutely no point in catching these because nothing your puny user code can do will fix the problem. Just let your “finally” blocks run and hope for the best. Catching and ignoring these fatal exceptions makes your program less robust since it will try to carry on as if nothing happened in the worst of conditions, most likely making things worse. Not very Fail fastish. So, am I saying that ignoring exceptions is bad and should always be avoided? No, the bad practice is catching and ignoring general exceptions. Specific exceptions on the other hand is quite OK.
// So we couldn't find the settings file, big deal! Bad example, I know, but you get the point. Here’s another bad practice I come across every now and then. The problem is that in order to handle Exception we have to catch Exception, and if we catch Exception we have to be prepared to handle every other type of Exception, including the Fatal exceptions that we discussed in the previous section. So, if you feel the need to throw an exception, make sure it’s specific. If the idea of defining lots of specific exceptions puts you off, then the very least thing you should do is to define your own application exception to use instead of the basic Exception. This is nothing I recommend though, since general exceptions, like ApplicationException, violate the Be specific rule of the Three rules for Effective Exception Handling. It’ll make you depend heavily on the message property to separate different errors, so don’t go there. Performance. Throwing an exception with all that’s involved, like building a stack trace, will cost you a second or so. Annoyance. Debugging code where exceptions are a part of the normal execution flow can be frustrating. Eric Lippert calls those exceptions Vexing exceptions, which I concider a great name given the second argument. Make sure you’ll check out his article (link at the beginning of this article). Those were the three misuses of exception handling I concider worst. What’s on your list? Who wants a sloppy workplace? I’m not the kind of person who is easily annoyed, but there is one thing that gets into my skin – all the time. Inconsistently structured code. I hate arbitrary indentation, spacing and line breaks. It is close to impossible for me to assimilate a piece of sloppy code without first running it through a beautifier. I ran into such a code again today, and for some reason I started to reflect upon my negative reactions. What is it about messy looking code that makes me dislike it so much? The first thing that came to my mind was this: The source code is where I spend most of my time at work, and who wants a sloppy workplace? At second thought, that didn’t seem to hold – at least not for me. Here are a couple of pictures of my desk at work. My computer corner at home is even worse. 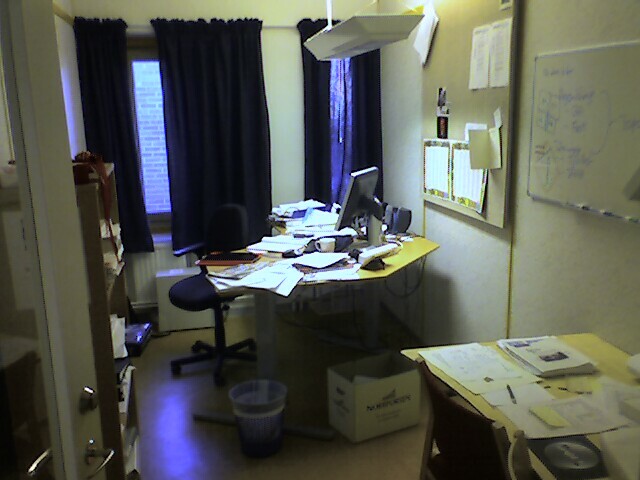 Clearly, I’m not a person who cares about a tidy workplace. So what’s the reason then? Why can’t I stand to look at sloppy code while I’m perfectly OK with turning my desk into a dump? Well, it beats me. If you have an idea, please let me know. This is the third post in my Tools of The Effective Developer series. The other two discussed the habit of keeping personal logs, and the habit of daily planning. Now the time has come to the habit of programming by intention. Please note that I’m not speaking of intentional programming, which by the way introduces some interesting concepts. Instead I refer to the simple kind that only requires your brain and the programming language of your choice. So what is programming by intention? Well, I like to describe it this way: if you are to implement a new set of functionality, and you don’t start with the implementation, nor the programming interface, but you start writing the code that is going to use it – then you are programming by intention. Why is this way better? The short answer is: Because we are lazy. The long answer is: We humans usually seek the simplest solution. Start with the utilizing code and you should find yourself pushing complex code and decisions right where it should be: behind the programming interface, nicely encapsulated. We also focus more on the task at hand, which decreases the risk of committing the sin of premature generalization. Programming by Intention is probably the easiest effective developer habit to acquire. It can be done at all levels of abstraction and there is no overhead cost. Therefor it’s my favorite habit. In the first post of this series I stated that the best tools, the ones that make developers efficient, are the habits that they possess. The habit I referred to in that post was the habit of keeping personal logs. In this post I will tell you about another habit that helps me in my daily work: The habit of personal planning. When I come to work, the first thing I do after catching up on the e-mails, is grabbing a pen and notebook and start listing today’s tasks. When I’m done listing the ones that are in my head, I turn to my work log and my calendar in search for more things to be done. At this point I usually have a big unordered list of tasks with various degree of importance. It’s always more than enough for one days work so I start prioritizing. In order to prioritize I rip out the page of my notebook to start a new list. Then I bring the tasks back to the notebook in order of importance. This time I draw a small square in front of every item, turning them into a proper todo-list. When finished I can start the real work, taking on the tasks one by one. It helps me do the right things in the right order, making me better focused and more effective. Because of the importance of closure. When I finish a task, the ceremony of checking the square makes me feel good and brings me energy to take on the next task. It helps me remember what I’ve done during the day. This comes in handy when it’s time to update my work log. I have tried several applications to help me in my planning, applications like Notepad, Microsoft Outlook and iGoogle’s todo-list. None of them could, in my opinion, compete with the good old pen and paper, so that is what I recommend using. But remember: it’s not the tool that matters, it’s the habit. A Software Programmer is someone who really knows the environment he is programming. He knows everything there is to know about the language, the API and the Framework he’s using. He can do low level optimizations because he knows in detail what the compiler does behind the scenes. He is indeed a Wizard and a Guru of his domain. A Software Programmer usually starts with the implementation (probably because that’s what he is doing best) and work his way outwards. A Software Developer on the other hand is a specialist at giving the customer (user) what he wants and what he needs. He doesn’t waste time on premature optimizations; he prioritize maintainability over performance, unless the performance is proved to be unacceptable; he has great testing skills, designing skills and communication skills; He is empathic, knows his HCI, and cares more about the user than he cares about his code. He cares so much that he usually becomes an expert himself of the users domains. A Software Developer starts with the interface (probably because that’s what he does best) and work his way inwards. A person can be both, or more of one or the other. In a team you want both kinds but they are rarely found within the same individual. I, for instance, consider myself a great developer but an intermediate programmer. One simple way to test what type you are is to ask yourself this question: Do I care more for the interface (GUI or Programming Interface) than I do for the implementation? If you think the implementation is unimportant as long as it does what you want, and is reasonably maintainable, then you’re probably a Software Developer. If you find the previous sentence a blasphemy, you could be a Software Programmer. Which one is it? Is D:s floating point handling too advanced? Method Reference Events? Nah, Not Yet.